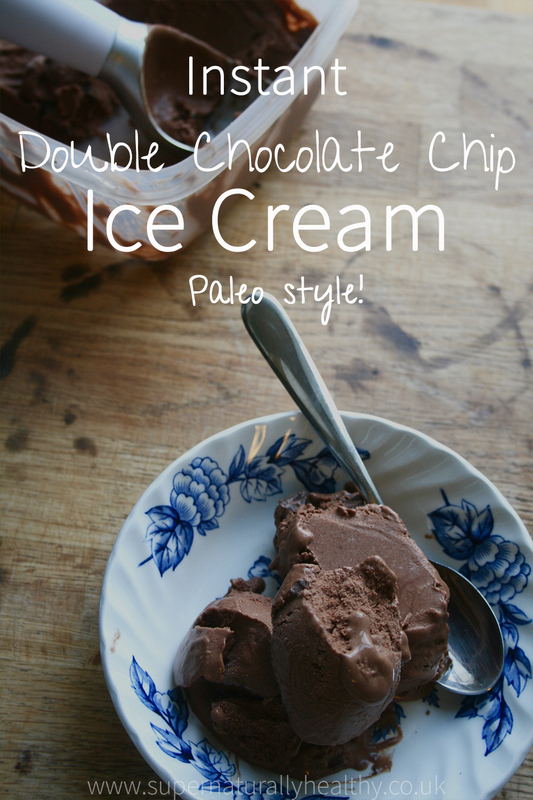 Instant Double Chocolate Chip Ice Cream – Paleo style! I probably don’t need to convince you that ice cream is awesome. And I still love to have nights like that now. But I like to avoid the refined sugar (it does crazy things to my mood) and the heavy un-organic cream (cream makes my tummy weird in large amounts) and other non-food like ingredients that are often on the label. 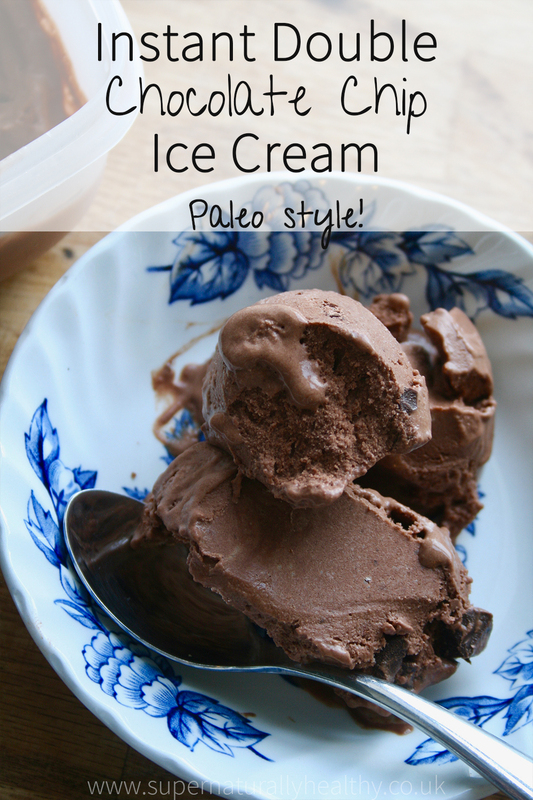 So this paleo, dairy-free, sugar-free and gluten-free recipe is the perfect alternative. (ALERT the Beat the Sweet: 21-day Sugar Challenge, where you can learn how to ditch the sugar addiction, eat cake and double your energy is now open for summer enrollment! And just to clarify, in case you are new to this Super Naturally Healthy world. No food is off limits….unless your body tells you so. If you love yourself some Phish Food and it makes your life a little bit more awesome then go for it, and enjoy it. But if like mean you just KNOW that these processed foods make you feel more crappy, more in pain, more low and more BLAH, then avoid them. I don’t restrict food for food sake, I don’t eat large amount of gluten or dairy because it is how I feel my best (and there is some good research behind it too, I am not convinced we ‘need’ gluten at all in our lives as its highly inflammatory and super low in nutrients and often sugar forming, but hey-ho that’s my view). But back to ice cream. I love this because it requires no ice cream maker, is instant, speedy and one of your five a day AND taste like awesome chocolate chip ice cream. Such are the joys of frozen banana ice cream – the perfect way to sort out that ‘I want some pudding‘ feeling that I get pretty frequently. All you need is a food processor (a blender would work but you may need more liquid) and thats it. Yum! In a food processor place the banana and and coconut cream and blend until smooth. This may take time, you may need to be patient. Making sure your using a small enough bowl can help with the processing. If it is very tricky very slowly add more coconut cream but only very slowly. Once a thick paste is form add the cocoa salt and chocolate chips. Serve immediately for a more of a soft serve (my fav) OR place in a bowl and put in the freezer for 45min-1hour stirring every 10-15 minutes.